Various Artists - "The Spirit Of Sireena"
The Spirit of Sireena is an eclectic one indeed. This collection, all tracks from artists on the Sireena label, is quite a mixed bag. Things get off to a somewhat unassuming start, with Diane by The Strangemen, which is pretty much a straightforward alt-rocker, somewhat reminiscent of The Replacements. The Shiny Gnomes offer up a bit of a folkier, more melodic take on the alt rock thing, with What Ulli Says, a tongue-in-cheek, satirical look at the hysteria over the misguided belief that some famous bands were devil worshippers, and the whole backwards masking controversy of the 80’s. Things get quite tasty as The Perc (aka Tom Redecker of The Electric Family) enters the scene with his deeply mellifluous voice on his folk rock psychedelic tune Good Grass, Bad Boy. The Perc in turn is joined by The Hidden Gentleman for The Infant King, a psychedelic smoker with strumming acoustic guitars, groaning electric guitars, swelling organ, upbeat rhythms, and dreamy lyrics (sung by both a female vocalist and Tom Redecker)... easily the best track on the album. In direct contrast is Barbara Gosza’s sparse acoustic guitar and beautiful voice, with its ever so slight rasp (reminded me a little bit of Edie Brickell) on Harder Than That. Now I must admit, I was really surprised to see Willie Nelson’s name on here, but there it was, on the next track with Hermann Lammers-Meyer (also from The Electric Family). But then I thought, old Willie has always been at the forefront of progressive country for his innovative approaches to traditional music. But I was surprised again. The Part Where I Cry is strictly an old time country waltz. Like I said, quite a mixed bag! The Flying Klassenfeind also delve into country with a cover of Gram Parsons’ Sin City, but this is totally twisted country, filtered through LSD, and sung by a bunch of drunks around the bar! The Pachinko Fake revs things up with Wrong Notes Don’t Exist, a definitely Krautrockesque freakout with driving percussion, pulsing electronics, wailing, squonking sax, and flighty flute. The Electric Family finishes things off with Bricks of Time, a slowly building, moody trip through the ancient past that’s equal parts Pink Floyd and San Francisco psychedelia. 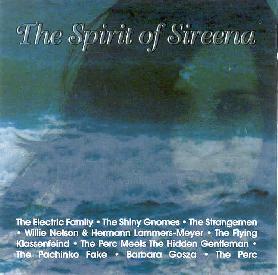 For those with eclectic and varied tastes, The Spirit of Sireena offers up a unique collection of artists with different visions, coming together all on one CD. Fore more information you can visit the Sireena Records web site at: http://www.sireena.de.